Borrowing from Banksy: hope he doesn’t mind but it makes a really makes a nice header for email template. If you haven’t heard of the graffiti artist Banksy, you should really check out his work. A mystery man going only by the alias ‘Banksy,’ this cat is one awesome environmental artist who finds a unique way to intelligently mix images into urban landscapes, and provide needed editorial comment on culture and society at large. 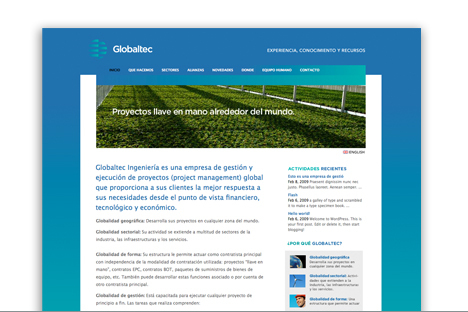 We used one of his images in our new newsletter banner and attempted to do to him what he does everywhere. If you look at his work in the video below, perhaps you’ll see what we mean. Building a custom CMS: whatever you do, please don’t try this at home. Client’s lofty ambitions create search engine lovable tourist portal, but one heck of a complicated CMS. MyNurish.com: rebranded product line and ecommerce store. 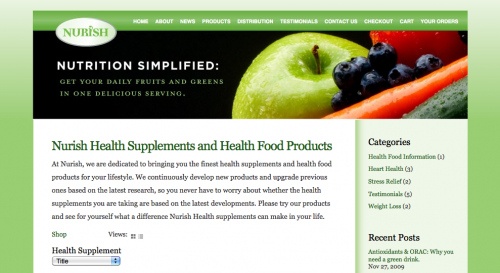 In the past year, Zosel&Co has entered into a marketing agreement with Nurish, a health foods and greens supplements startup manufacturer. As part of the partnership, Zosel&Co has created new branding, packaging design, and an e-commerce website that is now selling a complete line of health supplements online. 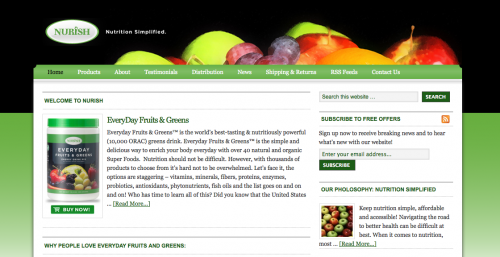 In 2004, Nurish was the first to distribute a major ”greens” blend in North America. A blend known for its sweet, minty-tasting flavor and its high concentration of dried fruits and vegetables. The blend was an instant success. 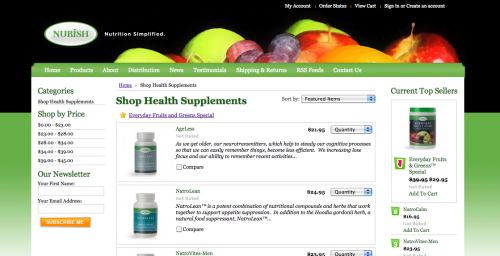 So much so, that within one year it became their #1 selling dietary supplement. 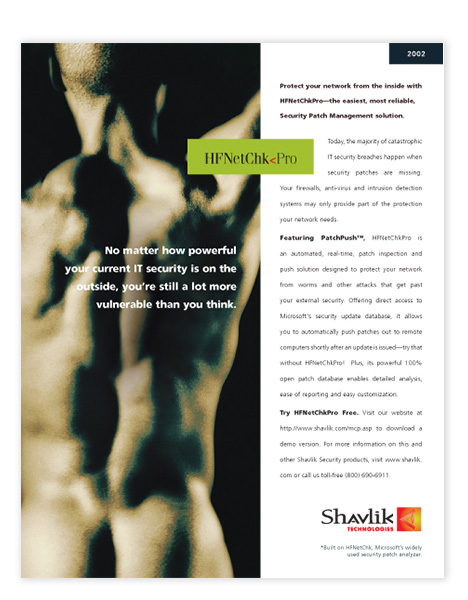 Shavlik Print Ad Campaigns 2002-present. 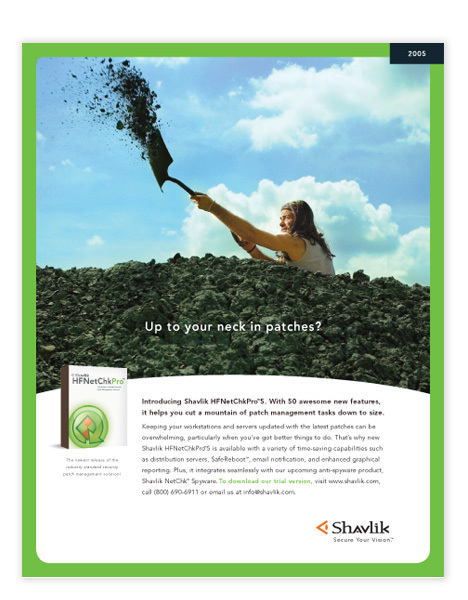 Some great branding ads created for Shavlik Technologies over the years that have help them emerge as the #1 player in the IT security, and network configuration management software industry. Give company founder Mark Shavlik a lot of credit for having a lot of vision and bold attitude toward marketing his company. These ads are a testament to his marketing savvy. 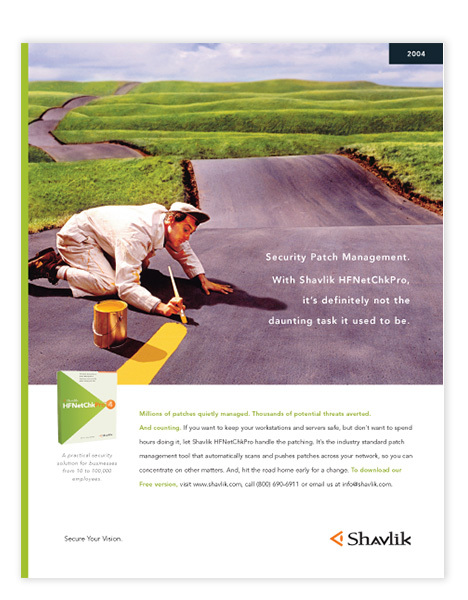 August 2002 -- A virtual unknown in the security patch management market, Shavlik chose to make a bold statement with their first major branding ad. Principal Mark Shavlik was a bit nervous about the direction, but did not regret it later as brand recognition improved steadily, and lead generation improved. October 2002 --This appears to be a fairly standard corporate ad, but it caused quite a stir in the IT industry, particularly with the target audience -- Network Administrators. It seemed unbelievable to admins that such attractive young ladies could be found in the IT environment, wearing such fetching attire. As it turned out, the attention was good for brand recognition. January 2003 --This ad is a testament to the marketing genius of Mark Shavlik. 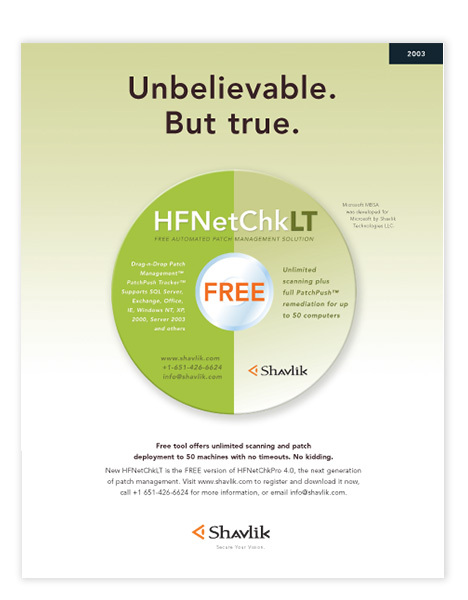 Mark felt offering a fully functional version of the flagship HFNetChkPro (up to 100 users) was a sure fire way to hook the industry on Shavlik's Network Security Product. 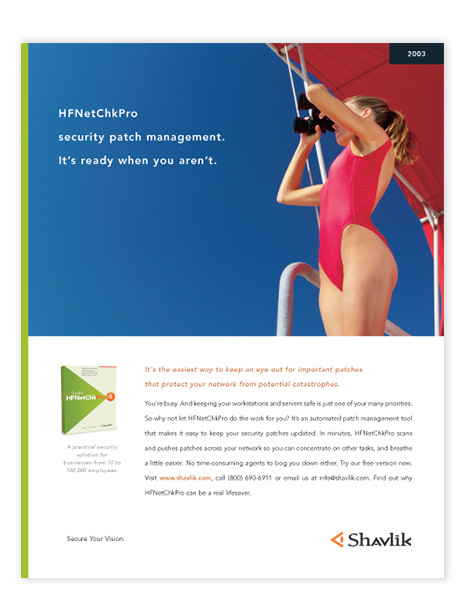 By July 2003, sales for HFNetChkPro were approaching $15 million. Not bad. September 2003 --Pictures of attractive women. If it worked once, could it work again? Turns out, Network Admins approved. And sales kept soaring. 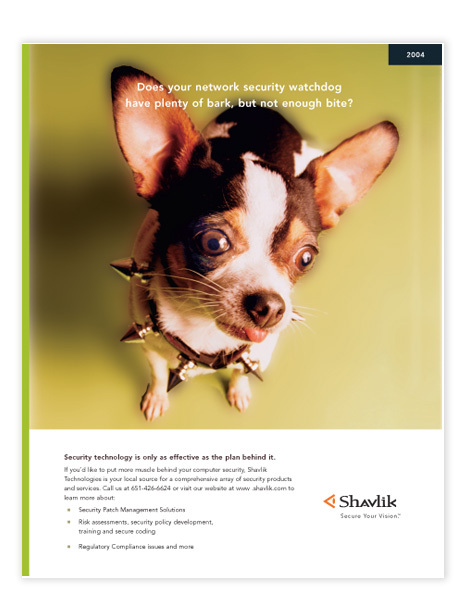 October 2003 --Shavlik needed an impactful ad to promote its Security Services Group. Who could ignore a mug like this? November 2004 --Now that Shavlik had the attention of its primary target audience, Network Admins, the branding strategy was to continue to show them that we understood their daily problems, and could offer a simple solution. November 2004 --More of the same: we feel your pain. And here's a way to solve it. Looking to generate leads on the internet? You may not need a website. Many small businesses looking to connect with new customers via the internet share a very common misconception about internet marketing. They believe the solution to lead generation is paying a web developer to build a search engine friendly website that will attract their prize customers, and close the sale. When it comes to truly effective lead generation (B2B or B2C), a well-designed landing page system connected with a highly targeted paid search (adwords, PPC) campaign is the magic bullet that most business owners really need. If all you’re after is reaching as many customers as possible for the lowest cost, shelling out big bucks to build a website doesn’t really make sense. 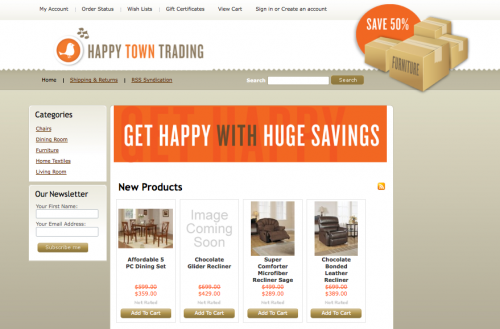 Create a Google Adwords campaign targeting Minneapolis Western Suburban Zip Codes using ads and keywords promoting their capabilities and testing special promotional offers. Create a series of specific landing pages each connected to specific ads, each with appropriate conversion forms. 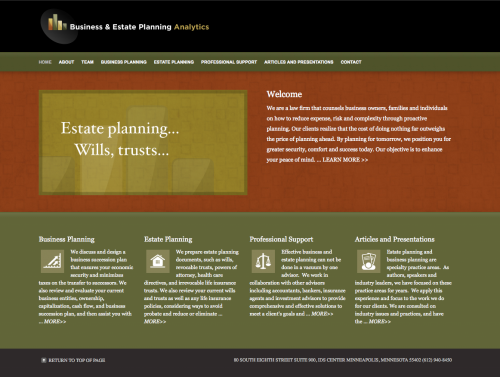 Low upfront cost – a fraction of the cost of building an entire website dedicated to promoting your business. 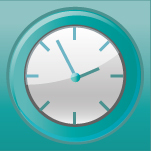 Start generating leads immediately – total project time is less than 10 days. Change on-the-fly marketing – change promotions, ads and landing pages in a heartbeat, at very little cost. Precision targeting – create a unique combination of ads and landing pages targeted by geography and demographics. WordPress – not just for blogging anymore. When most people think of WordPress, the popular, easy-to-use blogging software used by millions immediately springs to mind. 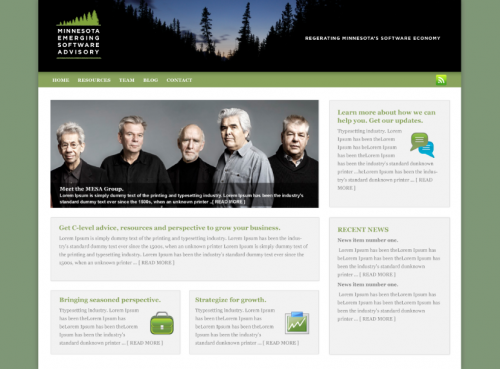 Here at ZoselCo, we think of WordPress as the website building tool without limits. You see, the WordPress platform is continually improved through a worldwide open-source community of developers that create plugins and modules to offer virtually any type of functionality any business needs. In the past four months, we have done some great work making great strides in offering WordPress as a powerful, easy-to-use content management ssytem for businesses of any size who need a powerful marketing website that’s ready to take advantage of the many up-and-coming social networking opportunities. 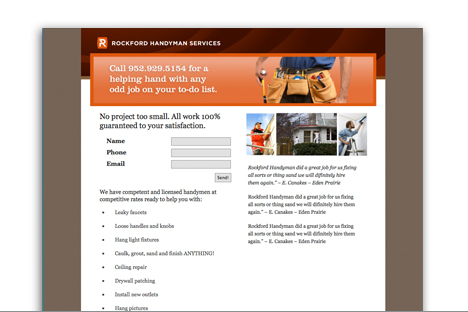 Rockford Handyman ‘Change-on-the-Fly’ Landing Page System — To generate leads, you don’t have to spend a ton of money to create an entire website. All you need is a change-on-the-fly landing page system connected to your localized Google Adwords account. Setup is fast and easy. Perfect for any business that just wants a no-frills marketing system that allows your to easily add as many different landing pages as necessary, until you find the right formula to convert leads. 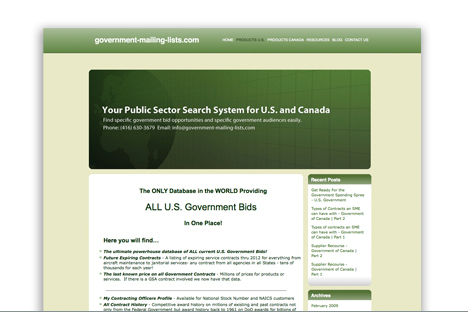 Instant ROI for Government-mailing-lists.com — This is a fully Search Engine Optimized website for the Toronto based government marketing firm has already paid for itself, according to owner Richard Furlong. ZoselCo connected with Furlong through marketing discussion groups on the popular social networking site LinkedIn. Greenbonds — the goal is to establish a renewable source of national and local investment capital for green technologies and solutions by introducing a new federal savings bond program. 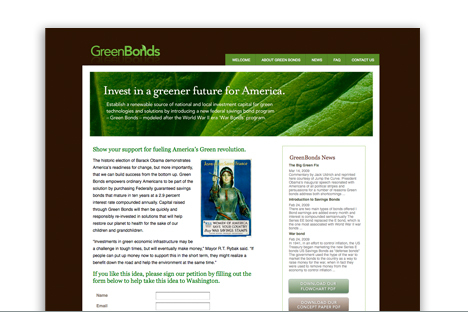 Green Bonds is modeled after the World War II era ‘War Bonds’ program. The site is intended to help generate 10,000 signatures necessary to make the concept a reality.